The Quietus is very pleased that for the next week we'll be opening up a room in our pixelated internet house for those gentlemen of the Tindersticks to come in, hang up their excellent tailoring, pop their cufflinks and sit down for a glass of Bordeaux and a stream of their new album, The Something Rain. When you've a voice as distinctive as that of Stuart Staples doing something different with your music is always going to be a tricky proposition. 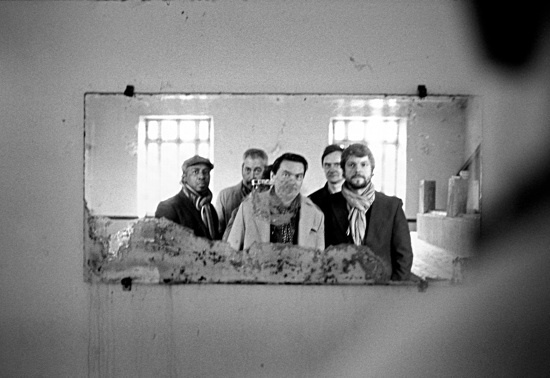 Happily, though, The Something Rain stands among Tindersticks' finest work, tracks like 'Show Me Everything' excellent, winking chamber pop; and odder instrumentation and setting creeping into 'This Fire Of Autumn', which combines the Gallic motorik of Stereolab with a backing vocal-laden chorus of which Leonard Cohen would be proud. Then there's the brooding yet smooth melancholy of 'Medicine', the murmuring odd caper in 'Frozen', or the thoughtful jazz-flecked 'Come Inside'. Preorder The Something Rain on iTunes here and the Tindersticks website here. The Tindersticks play a residency at London's Soho Theatre next week, from February 22nd to 25th. Needless to say, these dates are all now sold out.